Rosewood Little Dix Bay will close May 1, 2016 for an 18-month renovation. Once it reopens, I'll head back down and report about the changes. Later this afternoon, I'll join a group of other hotels guests and locals for the weekly round robin at the revamped tennis center at Little Dix Bay. At the moment, however, I'm gazing out the window of my room, past seagrape and coconut palms, at the astonishingly clear turquoise waters that gently lap the beach. I'm trying to decide between snorkeling along the reef just 100 yards off shore or taking advantage of the light breeze and taking a Sunfish out for a sail. If I am somewhat slow to choose it's only because I've just come back from the spa and a "Seaside Sedation Massage," which has in fact left me stupefyingly relaxed. Little Dix Bay, which like its sister property Caneel Bay was originally developed by Laurance S. Rockefeller, has been undergoing a transformation. Part of that consisted of upgrades and additions. but according to one guest there has also been a change in attitude: "It used to be very British," a guest who's come every year for the past five told me as we sat at the Pavilion Bar. "Now it's more American. There was a time when staff would tell me to take off my baseball cap. Now you can wear shorts in the restaurant." Secluded in its own north-facing bay, out of sight of development on the rest of the island, Little Dix feels remote. Yet "town," as defined by Spanish Town is only a mile away and accessible by cabs available at the entrance. That feeling of having totally escaped aside, Little Dix's principal asset is a sinuous, half-mile ribbon of soft sand protected by an offshore coral reef and bordered by very shallow,turquoise waters. The rooms, most slightly set back in vividly colored tropical gardens, occupy a necklace of low buildings that follow the curve of the beach, so that most accommodations are just steps from the sand. Two open-air restaurants—The Pavilion and The Sugarmill—stand to the west of the mid point, adjacent to a two-tiered swimming pool. Behind it all rise low hills covered with dryland foliage of trees and shrubs and now dotted with villas. Hiking trails lead up to low hills at either end. Room rates include a catalog of free activities and services, among them waterskiing; snorkeling gear, lessons, and guided tours; water taxis to other beaches; use of Sunfish, sailboats, and kayaks; nightly movies; use of the fitness center; wi-fi, and, most important, court time, some tennis clinics, and the weekly round robin. This abundance of no-cost diversions has the effect of scattering guests to the point that even when the resort is full, as it was on my last visit, it doesn't feel crowded. Tennis players, meanwhile, can look forward to half a dozen tennis courts and two pickleball courts, a fully stocked pro shop, player matching services, and some sort of clinic or round robin on weekdays in season. Those round robins often draw local residents, who can provide first-hand advice about where to eat and what to do on the island (a snorkeling trip through Boulders and grottoes of the Baths of Virgin Gorda is not to be missed). With six hard and artificial grass courts for 100 rooms, Little Dix has one of the better court:room ratios in the Caribbean. Like its sister property Caneel Bay (a ferry connects the two several days each week, making it easy for guests to divide their holiday between the two properties), it has a long history of being managed by Peter Burwash International. The courts have all been recently resurfaced and abut a handsome pro shop and fitness center with stone pillars, stucco walls, and a metal roof. Tennis Staff. Ryan Everett currently directs the program. Originally from the Finger Lakes district of New York, he played junior college tennis, receiving a National All American Designation, but discovered he loved teaching more than playing and after earning a Bachelor's Degree in chemistry returned home to teach in local clubs before joining Peter Burwash International. He inherited a mature program that whose weekly roster includes a mix of clinics and drills as well as a round-robin social mixer with locals, who also provide a small base to draw on for game matching if other hotel guests aren't available. The pro shop supplies free demo racquets and even tennis balls (which can be expensive in the Caribbean). Courts & Fees. 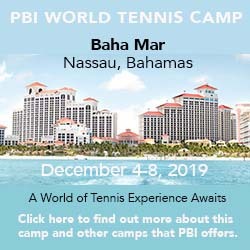 Six courts—four artificial grass and two hard surfaced with Plexicushion, two with lights—arrayed singly or in pairs to either side of the pro shop and fitness center. Shingle-roofed gazebos provide courtside shade and there are water jugs in shingled enclosures like tiny houses. Court fees: None. Beach. The beach at Little Dix extends for half a mile. Bohios, or thatched umbrellas, shade pairs of cushioned lounge chairs along the entire length of the beach and are free for guests to use. The sand to the east of the dock has a softer consistency than the sand to the west, which has more tiny fragments of shell. The waters along all of it are very shallow and remarkably warm. In addition, guests can request a free shuttle to any of nearly a dozen other beaches—The Baths of Virgin Gorda the most famous among them—located elsewhere along the west coast of Virgin Gorda or on such nearby islands as Great Dog and George Dog. Spa & Fitness Center. The Spa sits atop a ridge at the western end of the beach. Before and after treatments you can lounge around a terraced pool with views across the water of other islands, the quiet of the secluded setting only broken by the sound of the sea washing the shore below and the birds in the trees overhead. Treatments take place not in rooms but in nine tiny huts scattered among lush tropical foliage and illuminated by the natural light that pours in through windows in doors that open onto a private outdoor patio. The spa also stages yoga classes. The Fitness Center shares a building with the tennis pro shop. Its dozen Cardio machines face outward through windows overlooking the courts while in between stand half a dozen Precor exercise stations. And ... Watersports abound, including snorkeling, sailing, kayaking, waterskiing. Hiking trails lead up into the hills. And on various days there are guided garden tours, hands-on exhibits by a reef expert, local conch and coconut jewelry demonstrations, and more. Kids have their own Children's Grove, adjacent to the tennis courts, where 3-to-12-year-olds tackle a changing menu of activities, mostly indoors, from 9 a.m. to 4:30 p.m. Monday through Saturday. There's also a room for older kids with board games and a computer. Options range from garden rooms to three-bedroom villas. Built in clusters of two or four rooms in one or two-story shingle-roofed stucco-and-stone structures, these tend to be elegantly simple, with tile floors, red cedar doors and trim, teak, rattan and wicker furnishings. Some have both tubs and indoor and outdoor showers. All have Bose Wave DC players and air conditioning; none but the villas have televisions. Most are within sight of or a short stroll from the beach with the exception of the hillside villas (which come with a golf cart). Since my visit, Little Dix has brought in Ricardo Cera as Executive Chef. His menus at the resort's three restaurants—the fine-dining waterview Sugar Mill, the open-air Pavilion beneath conically shaped shingle-roofed Polynesian pyramids, and the oceanside Beach Grill adjacent to the dock and watersports center—focus on the culinary bounty of Virgin Gorda, especially the fresh fish and locally grown produce. Meal plans are an option. Travel Instructions. From North America, most flights are likely to be routed through San Juan, Puerto Rico and then on to Terrence B. Lettsome Airport (EIS) on Tortola, where ferry service is available directly to Little Dix Bay. American Eagle, Liat, and Cape Air all have service from San Juan to Tortola. Alternatively, you can fly to St. Thomas and board a ferry there. Limited service is also available directly to the airport on Virgin Gorda. The BVI Tourist Board website (see below) can provide details, as well as information about access from other parts of the world. General Tourist Information. Travel to the British Virgin Island requires a valid passport. The local currency is the $US; voltage is also the North American standard 110 volts. They do, however, drive on the left. For general information about travel to these islands, visit the British Virgin Islands Tourist Board website or contact one of their offices. There's one at 1270 Broadway, Suite 705, New York, NY 10001; phone 212-696-0400, toll-free 800-835-8530, or fax 212-949-8254. See the BVI website for other locations, including those in Europe.